In the history of sad sacks, is there anyone as gloomy as good old Charlie Brown? Cursed with equal parts determination and sour luck, the balding, blockheaded leader of the beloved Peanuts comic strip never gets a break. If it's not the kite in the tree, it's the rotten advice from his "psychiatrist." Yet, these hapless insults pale in comparison to his unrequited love for a certain little red-haired girl. And Chuck's not the only one who finds himself futilely trying to find love. Lucy pines for the clueless piano-playing Schroeder, and Charlie's sister, Sally, longs for her "sweet Babboo" Linus. Even Snoopy finds himself stood up at the alter at one point. 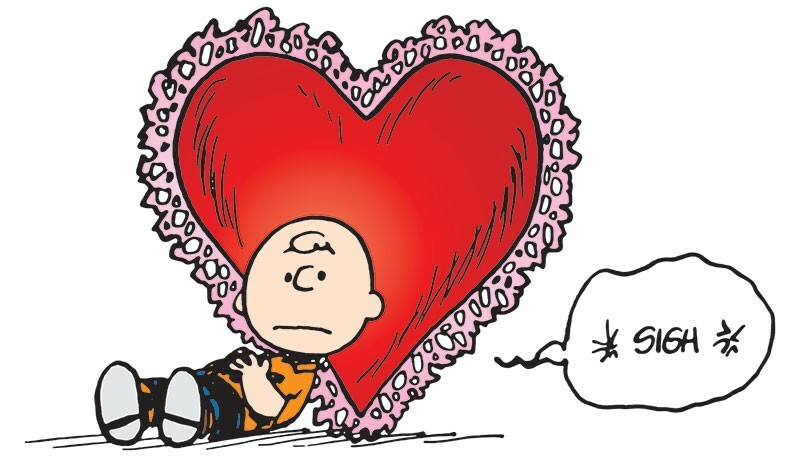 Certainly, if there's one cast of characters best suited to represent the pure agony of Valentine's Day, the Peanuts gang is it.